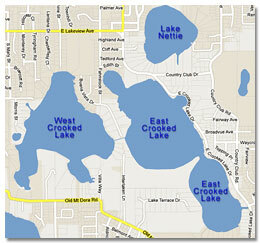 East and West Crooked Lakes are located in Eustis Florida. These lakes are both spring-fed white sand bottom lakes. The lakes were once joined. A small road built years ago cut the lakes into two sections. East Crooked Lake is especially beautiful and as it winds it's way through the hills with luxury homes built into the surrounding hillsides. Homes built on the high ridge surrounding the lake have panoramic view of the lake below. These lakes are clear spring-fed lakes with white sand bottoms. Both lakes are private. A small boat ramp on the east side of East Crooked Lake has no parking, which renders it unusable to the public. Fishing in both lakes is very good with almost no fishing pressure. Lakefront homes on the Crooked Lakes are expensive, but more affordable than homes on Lake Gertrude. 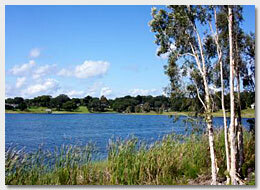 If you are looking for a great in-town water-skiing lake, East Crooked is a good choice. Lake Nettie is a small lake directly adjacent to East Crooked Lake. The landscaped hills surrounding the lake are beautiful to look at and the lake is quiet and peaceful with motor boats a rarity. Historic homes in the area with a beautiful picture postcard landscaping are a plus. If you have questions about the Crooked lakes, please contact us.